Learn English in England and immerse yourself in English language and British culture. The best way to learn any language is to surround yourself with the language you’re trying to learn. Language learning does not begin and end in the classroom, it continues in the street, shops, cafes and houses – all the places everyday life takes you. Learning English in England will provide you with the opportunity to be taught by true English language teaching professionals who have made teaching English their life’s work. Unlike English language teaching in other countries, only the most qualified teachers with experience of working in a number of overseas countries can find work in the UK. When you learn English in England, you can also start applying your new knowledge the moment you step outside the classroom. Our teachers use this fact to connect your learning to the outside environment, and use lesson content which reflects the world around you. This is a powerful way of learning in context which leads to superior results. At UK Study Centre, our trained consultants create solutions which meet your needs. For example, if your children are studying during the day, we can provide you with English tuition at times which fit around dropping off and picking up your children. We can organise for our professional, highly qualified teachers to teach you at home or at your place of work, and our lesson content is adapted according to your reasons for needing to use English. As well as the option of taking private lessons, there are hundreds of language schools and language training centres throughout the UK. UK Study Centre only works with high quality schools with a proven track record who are able to deliver at consistently standards. Whatever your level of English you will be able to join small group classes taught in the morning, afternoon or evening. You can choose to study on an intensive course or if you have other commitments study for fewer hours per week but focus on areas you want to improve. Most English language schools and training centres offer either standard or intensive delivery modes. Standard lessons include 15-20 hours of tuition per week, or 3-4 hours per day. Intensive courses usually include over 20 hours of language tuition per week. For even more specialisation, you can combine group classes with a number of one-to-one lessons, where you have extra time alone with your teacher to work on skills such as speaking and pronunciation, or themes which are specific to your lifestyle or work. 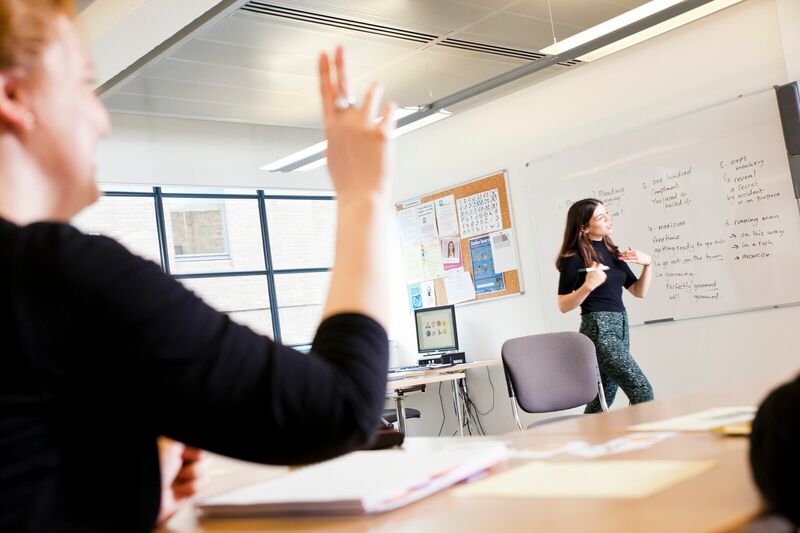 There are many schools and teachers in England that specialise in English language training for specific sectors and professions. English for teachers, including teacher training. There are many more specialist courses available in England. Please ask your UK Study Centre consultant for more information. If you need to pass a specific exam or achieve a particular score in an English exam, such as IELTS for study, employment or immigration purposes, we can help you find a school or a teacher to help you achieve the results you need. The majority of English language schools offer exam preparation courses for IELTS, TOEFL and Cambridge exams and we can also help you find individual tutors to help you achieve your goals. Another popular option is to combine learning English with the cultural experience of life in England, by staying in the home of a qualified and experienced English teacher. This option works well if you are coming to England for a short time on business, or if you would like to be close to your children whilst they attend a summer camp. You can choose from locations around the UK. As part of our consultation service we help you find accommodation for the duration of your course. There are many different options to choose from, depending on the level of comfort and practicality you require. Options include student halls of residence, sharing a house with other students, through to renting a temporary apartment and staying in quality hotels. We can also arrange homestay accommodation, where you have your own room in the home of an English family. This is a good way to observe life and culture in England, with the opportunity to meet English people, share mealtimes and conversation. How long do university courses last in the UK? Can I go to a language school in England if I don’t speak any English?